Though we got a glimpse of an alpha build of the Windows Store version of PowerPoint today, a full fledged Metro-ization of Office apps is reportedly not due for 2013. 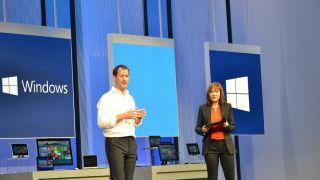 During Microsoft's Day 1 keynote at Build 2013, the company offered a peak oat PowerPoint, but according to ZDNet, it won't be until next year that Word, Excel, OneNote and the aforementioned PowerPoint are available in Windows 8 Metro versions. Codenamed "Gemini," the restyled apps are due in the Windows Store in 2014. There is a Metro take on OneNote, Microsoft's note taking app, as well as Lync, though updating the other core apps from desktop versions would bring all of the company's offerings up to speed. Another report on The Verge alternately said the Metro Office apps would be released this year, a time frame that makes a little more sense than 2014, according to the ZDNet report. Microsoft could be trying to keep expectations realistic instead of over promising, and we could very well see Office apps with a new look come the final release of Windows 8.1. During the Build keynote demonstration, Windows head Julie Larson-Green took attendees through a tour of the alpha version of PowerPoint. Presentation slides hosted video and transitions were graphically complex, while Larson-Green said it works on ARM and x86. It was as enticing looking as PowerPoint presentations can be, but we'll see what final tweaks Microsoft has in store before release. Whenever that may be. Curious what other apps were announced for Windows today?